Automating a set of steps can save you massive time and squeeze out human error. 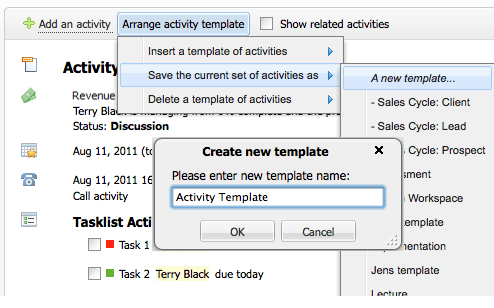 Solve lets you do exactly that with something called Activity Templates. An activity template is a set of activities listed on an existing contact, company or project blog that have been saved into a reusable template. With a single-click this saved copy AKA “template of activities” can then be inserted onto other contacts, companies, or project blog pages at any time. This saves you from recreating many activities manually every time you start a new initiative. Activity templates are shared with other users on your team which not only expands the benefits of time saving and fewer errors, but also spark “best practices”, constant refinement and automation. Generally Solve users set aside a special contact, company or project blog to store a “master set” of activities for a template. When a change is needed they edit the activity on this master record, then resave the master set into their template. Using the new “Template designer” you can take a peek inside those templates and make changes without having to maintain a master set. Inside the template designer you can open existing templates, create new ones from scratch and delete or rename existing ones. The secret weapon of templates has always been how they manage dates. With the template designer, instead of entering a specific date you enter a “number of days from now” value. For example, suppose you want to have a follow-up in a template and when it’s inserted the follow-up should be due 3 days. 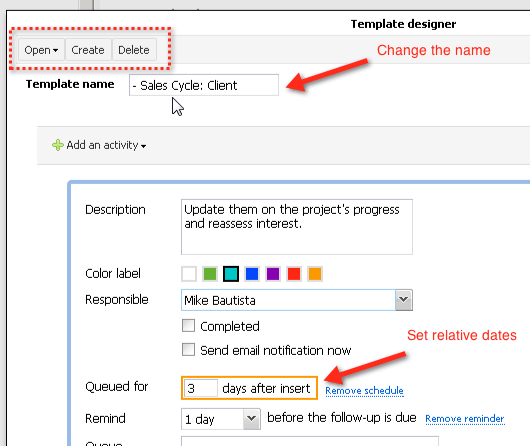 Set the “days after insert” value to 3 and whenever the template is inserted Solve will set the due date of the newly inserted follow-up for 3 days from that moment. Get automating your business processes quick with our Activity Templates tutorial and see how it all ties together.